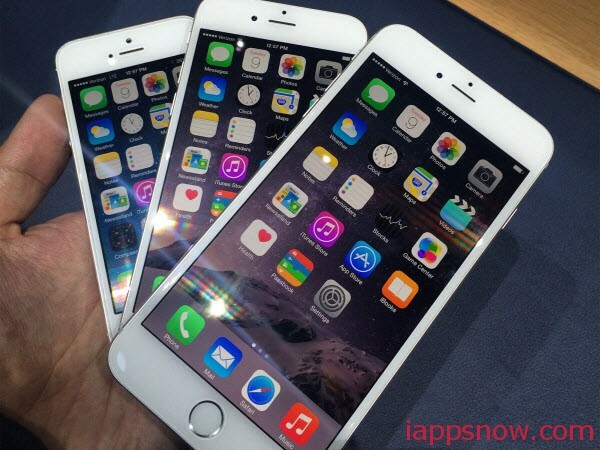 Which Audio and Video Formats Are Supported by iPhone 6? The recent released Apple’s 2014 new iPhone, called iPhone 6 (Plus), is finally pegged on September 9, and it amazes the iPhone buffs with a 4.7-inch 1334 x 750 (348 ppi) screen iPhone 6 and a 5.5-inch 1920×1080 (401 ppi) screen iPhone 6 Plus. Considering their bigger screen, blazing fast performance and great battery life, watching movies or videos on iPhone 6 would be second to none. As we know, there are numerous video formats flooding over the market each day, but only some of them could be played by iPhone 6. If you want to play videos on your new iPhone 6, you need to find out which audio and video formats are supported by iPhone 6 first. Here, we list the iPhone 6 supported formats for you as below. Motion JPEG (M-JPEG): Up to 35 Mbps, 1280 by 720 pixels, 30 frames per second, audio in ulaw, PCM stereo audio in .avi file format. Whatever that is, the video codec transcoding professor Pavtube Video Converter Ultimate will be your best aid for video to iPhone 6 conversion. Not only it can convert any video like AVCHD, MTS, FLV, WMV, MKV to iPhone 6 supported video formats like MP4, MOV, M4V, as well as the audio file format supported by iPhone 6/6+ like MP3, but also you can save yourself a lot of time with the preset profiles for most generation of iPhone as you can simply choose the recommended iPhone 6 video and audio settings from the accommodated preset profiles. If you are a Mac user, you can use its equivalent Mac version -iMedia Converter Mac to achieve your goal smoothly. 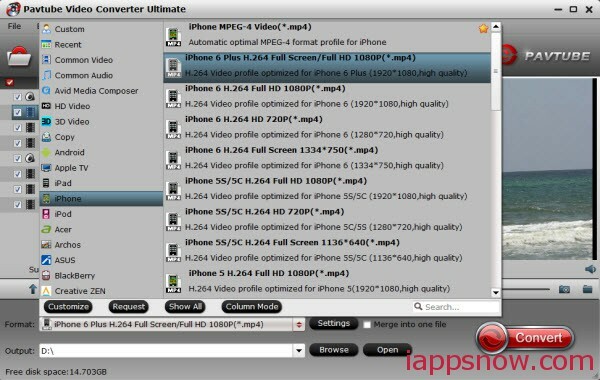 Download a trial version of Pavtube Video Converter Ultimate first. There is not time or function limits, but a watermark will be put on converted videos. Step 1. Load movies for conversion. A. Load video. Click “Add Video” on the upper left to locate source videos. B.Load DVD. Insert DVD to optical drive, and click “Load BD/DVD” to load DVD for DVD to iPhone 6 conversion. C. Load Blu-ray Disc. Insert Blu-ray Disc to BD drive, and click “Load BD/DVD” to load Blu-ray Disc for Blu-ray to iPhone 6 conversion. Note that you need a BD drive to read Blu-ray Disc instead of DVD-ROM. Step 2. Set iPhone 6 playable format for exporting. Now you need to set a format for iPhone 6 Video Conversion- Click “Format” bar, follow “iPhone 6 H.264 Full HD 1080P(*.mp4)” as the best profile for iPhone 6. Or choose “iPhone > iPhone 6 Plus H.264 Full Screen/Full HD 1080P(*.mp4)” as supported format for iPhone 6+. The output videos could fit on your device perfectly. Tip: You can click the “Settings” to adjust the video and audio parameters of output files. In the Video Settings, you can select Encoder, Frame Rate, Resolution (you could define it yourself according to your iPhone 6) and Bitrate for your movie. Step 3. Start converting Video to iPhone 6 supported video format. Click “Convert” button to start converting iPhone 6 Video Conversion. After conversion, connect iPhone 6 with PC and sync the converted video to iPhone 6 via iTunes. Now, you can watch all kinds of movies on iPhone 6 without any compatibility problem. Working as the best Movie Converter for iPhone 6, Pavtube Video Converter Ultimate can meet all your Blu-ray/DVD ripping and video converting needs. It enables you to rip all kinds of movie files to iPhone 6 movie format like MP4, MOV, or other formats like FLV, H264, MPEG4, WMV, MKV, MP3, etc and directly convert DVDs to iPhone 6, iPhone 5S/5C, iPhone 4S/4, iPad, Samsung, HTC, Windows Phone, etc without compromising quality. Besides, you can spice up your movie by cutting, cropping trimming and adding subtitles to better suit your iPhone 6 bigger screen. 1. If you are a DVD lover, turn to the gudie to learn how to Rip DVD movies to iPhone 6 for watching. 2. For BD collectors, learn how to play Blu-ray video on iPhone 6 here. iPhone 6 on Wikipedia: The iPhone 6 is an iOS smartphone designed and manufactured by Apple Inc.. Unveiled during a press event on September 9, 2014 along with the iPhone 6 Plus, the devices serve as a successor to the iPhone 5S. Read more tips or solutions for iPhone 6(Plus) here. Still have some trouble about iPhone 6/6 Plus Video Formats Supported? Please feel free to comment below.